After nearly two years of arduous negotiations a comprehensive agreement on the nuclear program of Iran was signed in Vienna on 14 July 2015. In exchange for reducing Iran’s nuclear activities drastically, the United States and the European Union would lift their nuclear-related sanctions on the Iranian economy. Most countries and international organizations welcomed the agreement. Will U.S. President Obama be remembered as initiator of this 'historic' deal? The Joint Comprehensive Plan of Action (JCPOA) is a nuclear agreement signed in Vienna on 14 July 2015 between Iran, the P5+1 (the five permanent members of the United Nations Security Council—China, France, Russia, United Kingdom, United States—plus Germany), and the European Union. rebuild its Arak heavy-water reactor, using a design approved by the international community to make the production of weapons-grade plutonium impossible. If Iran honors the deal, Iran would not have the kind of fissile material it needs for a nuclear bomb, but at the same time the international community allows Iran to keep a non-military nuclear program going. Iran has always maintained that its nuclear program is being used for peaceful purposes. The period of time that it would take for Iran to acquire the material it needs to make one nuclear weapon --'breakout time'--, currently assessed at two to three months, would be extended to about one year under the deal. That year-long breakout period would be in place for at least 10 years. As provided for in the JCPOA, the agreement was formally endorsed by the UN Security Council, incorporating it into international law and making it legally binding. United Nations Security Council Resolution 2231 (2015), adopted by the Security Council at its 7488th meeting, on 20 July 2015, lays out the steps for terminating sanctions imposed by seven past Security Council resolutions, but retains an arms embargo for an additional 5 years and ballistic missile technology ban for 8 years. The resolution also codifies the "snapback" mechanism of the agreement, under which all Security Council sanctions will be automatically reimposed if Iran breaches the deal. The U.S. and the EU states in the P5+1 can veto ongoing sanctions relief but Russia and China can’t veto a return to the status quo ante. A scenario where Iran is non-compliant with the JCPOA yet escapes the old sanctions simply won’t be possible. The resolution did not affect the sanctions imposed separately by the United States and the European Union. "Certain sanctions related to Iran’s support of terror, human rights and weapons program will remain intact,” Farhad Alayi, a lawyer in Washington, D.C., who is an expert in sanctions law, said in an email. “Many parts of the U.S. sanctions infrastructure against Iran predate the nuclear issue,” he added. The United States committed specifically to “effectuate the termination of all nuclear-related sanctions,” but the sanctions on doing business with Iran “would not apply to non-U.S. persons.” In other words, Americans were still subject to them, even if they could be skirted by going through third-parties, such as those in Europe. The EU continues its sanctions relating to human rights and its sanctions prohibiting the export of ballistic missile technology. On 20 July, the European Union formally approved the JCPOA via a vote of the EU Foreign Affairs Council (the group of EU foreign ministers) meeting in Brussels. This sets into motion the lifting of certain EU sanctions. Member states of the European Union agreed to lift sanctions in finance, banking and insurance; oil and gas; shipping and transport; and other sectors, while also unfreezing the assets of Iranian banks, including the Central Bank of Iran, individuals and other organizations. Compared to the United States, the European Union has much more aggressively scaled back its sanctions framework than the U.S., although EU sanctions are applicable only in Europe and U.S. sanctions have an extraterritorial effect. In the European Union the "snapback" mechanism is even more complex, where unanimity is needed to put the old sanctions back into place again. Instead, the European Council should do the "snapback" and the old sanctions should be lifted only in case of a qualified majority. Besides, business deals effectuated in the meantime will hold and therefore sanctions will be less effective. Since U.S. President Barack Obama entered the White House, the Iranian issue has been on his political agenda. The Joint Comprehensive Plan of Action (JCPOA) is a focal point of Obama's foreign policy. During a press conference on Wednesday, 15 July President Obama said: “The comprehensive long-term deal that we achieved with our allies and partners to prevent Iran from obtaining a nuclear weapon represents a powerful display of American leadership and diplomacy. It shows what we can accomplish when we lead from a position of strength and a position of principle when we unite the international community around a shared vision and we resolve to solve problems peacefully.” It looks like the continuing foreign policy of interventionism of the Bush administration has been changed into a diplomatic one. At least, the Obama administration has showed the international community that long term diplomatic pressure is a better alternative. Of course, Obama's successors will be responsible for implementing the nuclear deal. 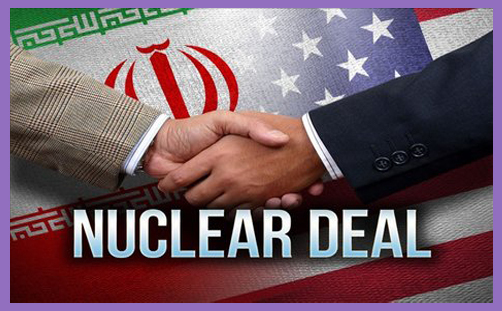 Let's hope Obama('s legacy) will be connected to this deal in the history books in the near future. The agreement is undergoing a sixty-day review, starting from 20 July 2015, in the United States Congress under the terms of the Iran Nuclear Agreement Review Act. Republican leaders vowed to attempt to kill the agreement as soon as it was released, but President Obama has said he will veto any resolution of disapproval. Thus, Republicans will only be able to defeat the deal if they can muster the two-thirds of both houses of Congress needed to override a veto of any resolution of disapproval. This means that 34 votes in the Senate could sustain a veto and place the JCPOA into effect. For critics of the Obama administration’s push for this Iran deal, the ability to resume sanctions was an important consideration. For now, the nuclear deal is a masterpiece of (nuclear) diplomacy. Bali, A.U., "Negotiating Nonproliferation: International Law and Delegation in the Iranian Nuclear Crisis", UCLA Law Review, 61 (2014), No. 2, pp. 232-325. Bernstein, J., Nuclear Iran, Cambridge, Massachusetts, Harvard University Press, 2014. Kaussler, B., Iran's Nuclear Diplomacy: Power Politics and Conflict Resolution, London, Routledge, 2014. Königs, T., "The IAEA’s Right to Visit Sites accused of Developing Nuclear Weapons Systems: The Parchin Facility in Iran", Amsterdam Law Forum, 6 (2014), No. 2, pp. 37-50. Obama's news conference on the Iran nuclear deal (Full text), (The Washington Post, 15 July 2015). Factsheet Iran and the Additional Protocol (Center for Arms Control and Non-proliferation] (July 14, 2015).